Trackspeed EFR6258 w/CNC Head - Miata Turbo Forum - Boost cars, acquire cats. Graph shows the runs from each iteration of my build, starting from bone stock. Red and blue lines are the current high power and wastegate tunes, respectively. And insane. Still on 205 tires, so I don't have full-throttle traction until 4th gear. Certainly gets up and goes though! Haven't had a ton of time driving it so far, been trying to track down a speed-based vibration. On new driveshaft #2, but still have issues above 80mph. Heading back to the shop for more diagnostics and possibly New Driveshaft 3: Carbon-fiber Boogaloo. I love the comment at the bottom of the graph: "Turbo and other cool things. Nice story bro." So what is going on here. What boost pressure are the two graphs coming in at. Wastegate is the 7psi? Or do you have something bigger? Are you running a boost closed loop strategy to hit a certain psi? Are you surprised that the torque curve tails off as much as it does? Would expect that higher flowing head and intake manifold to help prop that up. He's still on a VICs manifold, square top or S2 would help with the fall off up top. Wastegate was a hair under 9psi, high boost was 18psi. Open loop boost control for now, I need to tune it at the very least to get a decent bias table, there are plenty of online writeups on how to dial in your closed loop boost control that Don doesn't need to pay an hourly rate for me to watch and follow the instructions. 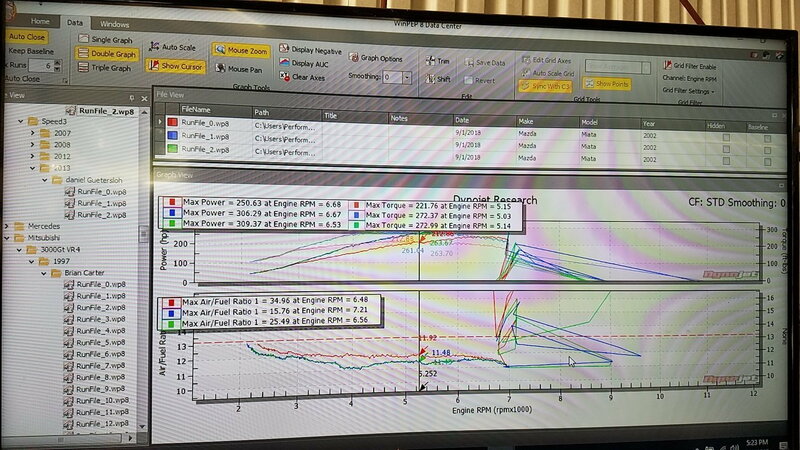 Wastegate is right around 9psi, the higher power EBC-enabled graph is at around 18psi. curly did the tuning, so he should be able to answer the rest of the questions. Timing was kept on the conservative side from what I understand, which may explain the drop off on top. Could have also been an intentional tuning decision to keep the 6-speed alive on track. I'm actually more surprised by the big torque peak, since I am running pump gas. 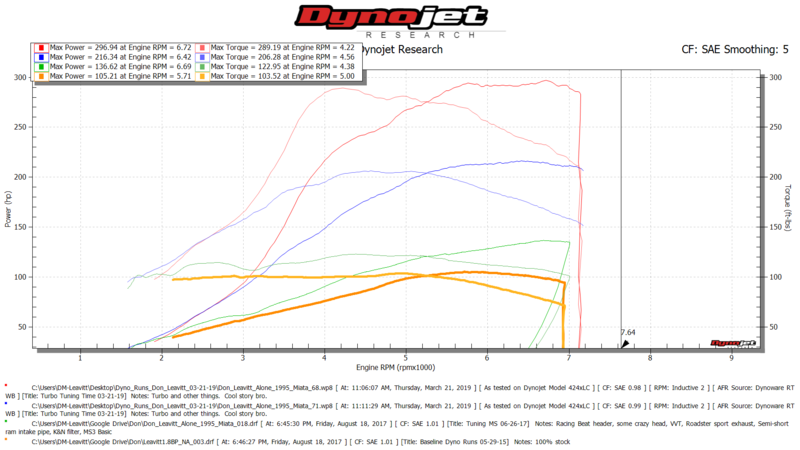 A few other dyno charts I was looking at were 10-20 lb-ft lower. EDIT: Josh beat me to the punch! looks good, makes a bunch of torque but does drop off faster than I would have expected. If the torque would hold longer thats an easy 330whp. Still though I bet it pulls hard. curly, there's a bit more to be had in the low end. I have a local customer with a near-identical setup (Stage 2 8.6:1 bottom end, CNC +1/+1 head, VICS IM, E85) and we are seeing 200tq at ~3100rpm on that car. You may be able to add a tiny bit of wastegate preload to bring the cracking pressure up without inducing creep on the top end. 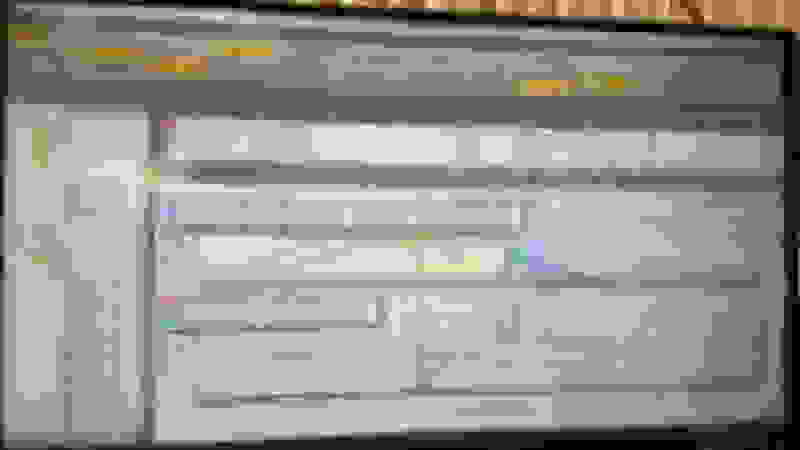 With NA heads or stock NB heads you can overdo it with the preload and there's not much of a penalty, but with heavily ported NB heads it's a very fine balance between too little preload (low cracking pressure, lazy boost onset under 4000rpm) and too much preload (boost creep at higher RPM). It is possible to get the best of both worlds, though. I would do that before you start digging into the EBC too far. Squaretop would be worth, oh, 40whp on this car with no other changes. Clearly I need more tire. Preload was one of the things I was going to adjust on the dyno, but we were worried power would be too high with the cnc head and built motor even on wastegate, especially while Don re-learns the car in forced induction mode on track. So when it made "only" 220, I decided to leave the preload as is for now. It all depends on if it's creeping up top or not. If boost rises all the way through the run, then you don't have any wiggle room. If boost is stable, which it appears to be based on the dyno, you may have room to add preload and still hold that same boost level up top. The low-boost actuator and a CNC NB head at 8-9psi is pretty much the absolute limit of the EFR's IWG, so it takes small adjustments to find perfection (like 1/4 or 1/2 a turn a time of preload). Using the medium canister, so might have a little preload to play with. Should have time to fine-tune things after the 15th and my work schedule slows down. Send us a pm and we'll take care of the squaretop for you. Will be interesting to see a before and after. Don, send me a full throttle pull to red line if/when you adjust preload, I can double check the fuel map looks adequate for the earlier boost that should create. The fun budget is pretty much blown at this point, but when/if I get the itch for more power I’ll drop you a line! Can do. Won’t be for a while though, got to get through tax season first. Your timing is likely pretty conservative, as i made 309whp and 273tq on 17psi. but with a rods only motor, 94 pistons, and a 200k mile untouched vvt head. On my Medium boost canister, wastegate only, the boost starts at 9psi and then jumps to 10-11psi and holds to redline. making 250hp, so its interesting to see yours actually holds 9psi to redline. maybe you have slightly less preload than me. My setup is likely pretty maxed out, You have lots more power to unleash! Kinda sounds like they want you to show everyone why they should buy a squaretop them. I think they are offering the manifold at no cost, you should pm them IMHO, I could be wrong. ^^^this is how I read it too.